essential reading for travelers and Scots alike. 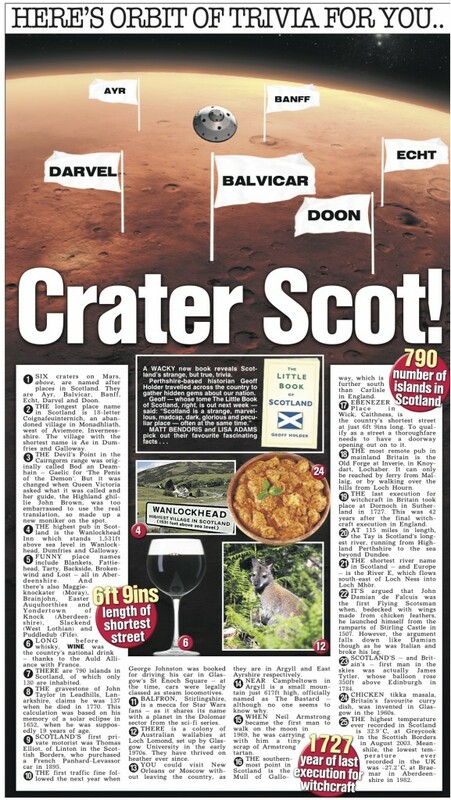 Saturday’s Scottish Sun. No doubt more to come. 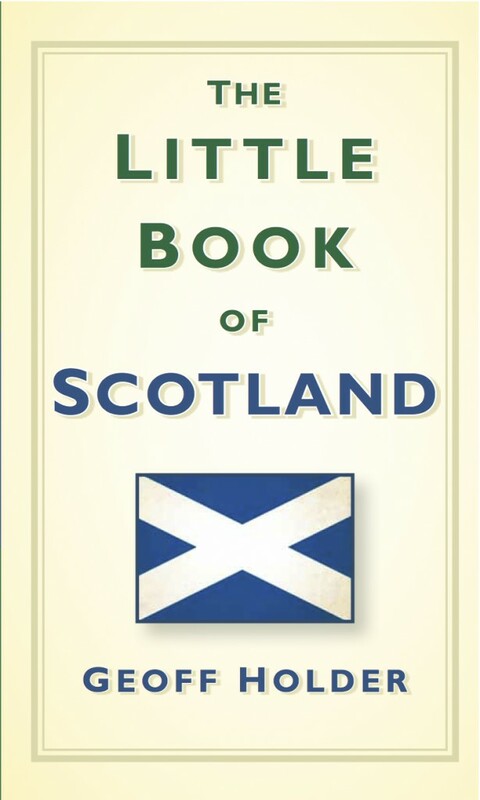 The Little Book of Scotland can be picked up online here or here or at your favourite bricks-and-mortar bookshop – support bookshops, people, especially independent bookshops, they are Good Things. This entry was posted in Book releases and tagged amazon, Braveheart, Commandos, geoff holder, history, Little Book of Scotland, local history, Mary Queens of Scots, miscellany, new book published, poltergeist over scotland, Sean Connery, the history press, trivia, Walter Scott, William Wallace on 03/02/2014 by Geoff Holder. The Little Book of Edinburgh is out on May 6. It was great fun to research and write, especially as I was forced to visit a great many museums, tourist attractions and cafés in one of the world’s most beautiful cities. Oh, the suffering. 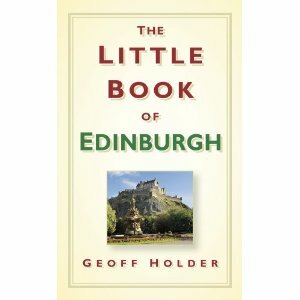 “The Little Book of Edinburgh is a funny, fast-paced, fact-packed compendium of the sort of frivolous, fantastic or simply strange information which no-one will want to be without. Here we find out about the most unusual crimes and punishments, eccentric inhabitants, famous sons and daughters and literally hundreds of wacky facts. Geoff Holder’s new book contains historic and contemporary trivia on Edinburgh. There are lots of factual chapters but also plenty of frivolous details which will amuse and surprise. This entry was posted in Book releases and tagged edinburghf, facts, geoff holder, little book of edinburgh, trivia on 09/05/2013 by Jamie Cook. On Monday (16th January) the Evening Times ran an article on your humble author, headlined Meet the new Mr Glasgow the History Man. Reporter Russell Leadbetter chatted to me about The Little Book of Glasgow, including the story of the city in the Second World War, and the tendency of Glaswegians, historically, to prefer riots over battles. The feature functioned as a trailer for a weekly column in the newspaper. From 23rd January I’ll have a column in the Evening Times every Monday. Entitled ‘Historical Times’, it consists of extracts from The Little Book of Glasgow – everything from sport to film, from architecture to pop stars, and from astronomical druids to zoological oddities. This entry was posted in Promotional and tagged article, evening times, Folklore, geoff holder, glasgow, history, little book of glasgow, Newspaper, trivia on 19/01/2012 by Jamie Cook. 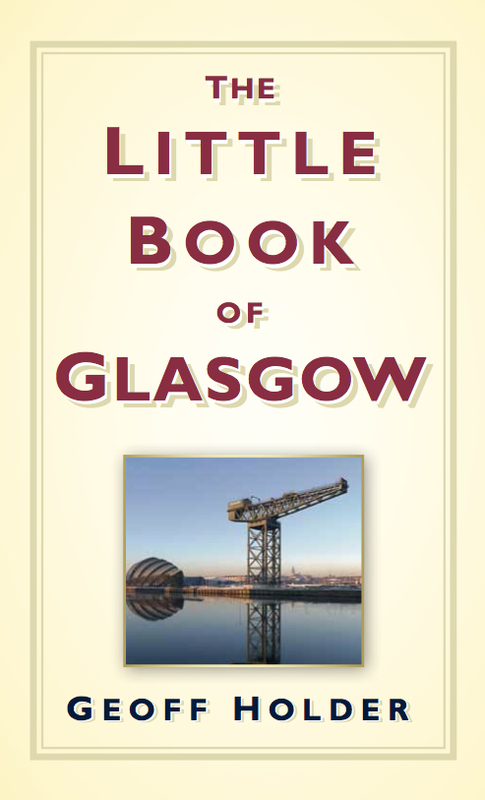 My next publication, The Little Book of Glasgow, officially hits the shops on 21st November. It is basically ‘1000 things you didn’t know about Glasgow’ – a mix of trivia, facts, bizarre historical titbits, artistic achievements, and peculiarities of animal and human behaviour. If you do know Glasgow, I hope it will shine a light on areas that were previously in shadow; and if you are new to the city, welcome to its leftfield wonders. 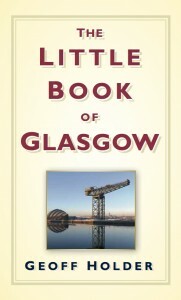 The book will tell you where to find sculptures of a Native American chief and an Egyptian pharaoh; which Glasgow-set film was actually filmed in London; how many pairs of shoes were fleeced from the city’s textile manufacturers by Bonnie Prince Charlie’s Jacobites; the story of how chicken tikka masala was invented in the city; and how Glasgow saved Britain in World War II. There’s also oodles of stuff on everything from Glaswegian poets and authors of graphic novels to the tiger escape at Glasgow Zoo, the speed of 18th-century stagecoaches, and an investigation into deep-fried Mars Bars. This entry was posted in Book releases and tagged facts, geoff holder, glasgow, history, jacobites, little book of glasgow, trivia on 09/11/2011 by Jamie Cook.